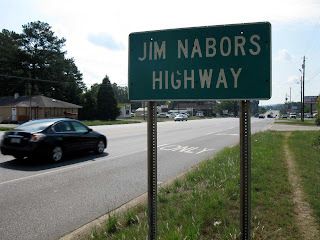 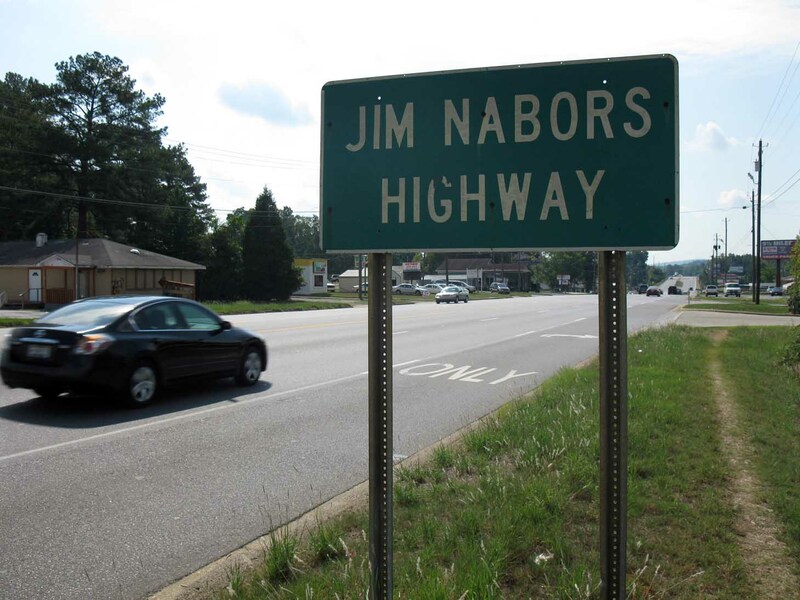 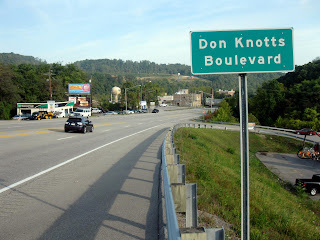 We completed our trinity of highways named in honor of actors from "The Andy Griffith Show": The Andy Griffith Parkway of Mount Airy, North Carolina, and Don Knotts Boulevard of Morgantown, West Virginia were seen in 2012, joining the ranks of the Jim Nabors Highway of Sylacauga, Alabama, toured in 2010. 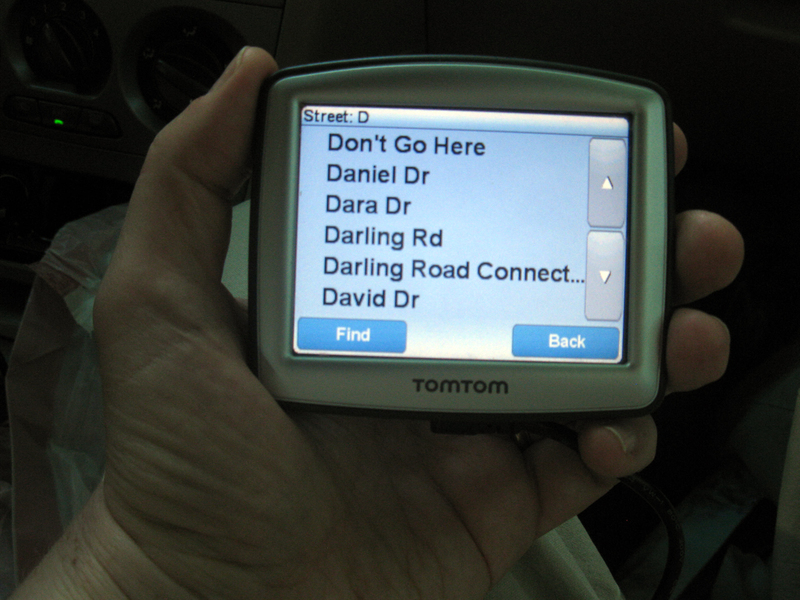 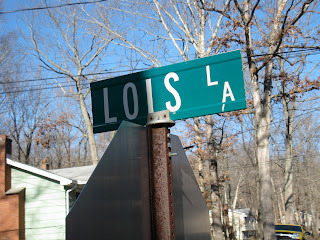 We saw lots of eccentrically named streets last year. 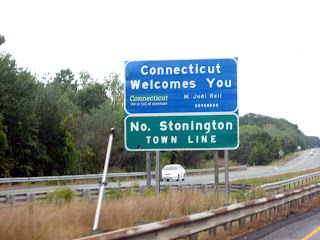 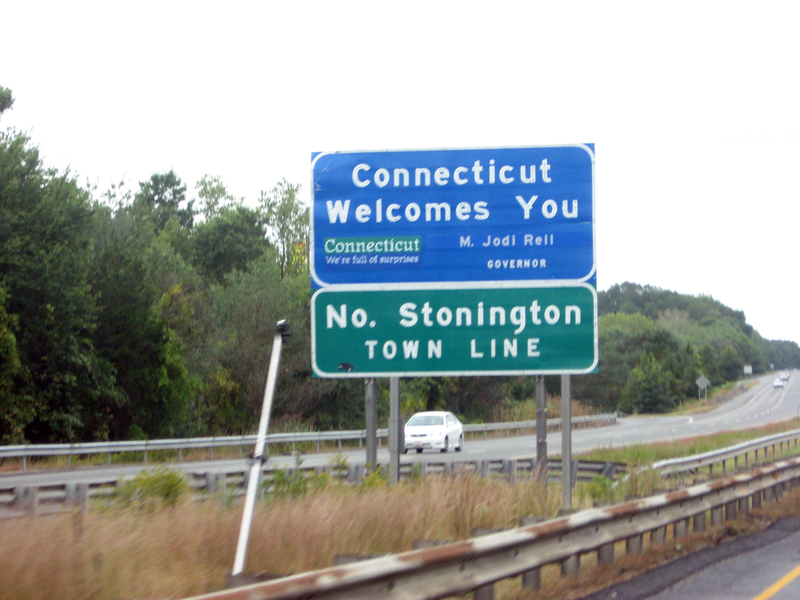 This one, from somewhere in Connecticut, is my favorite. 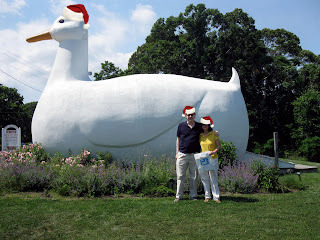 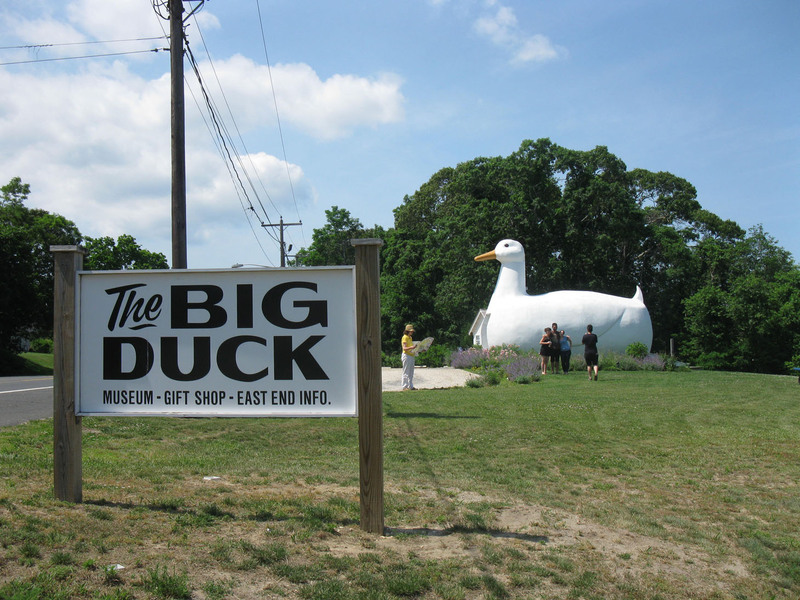 Here's hoping your holidays are all they're quacked up to be, from our eccentric roadside to yours. 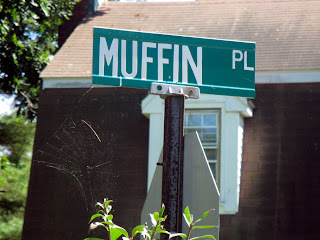 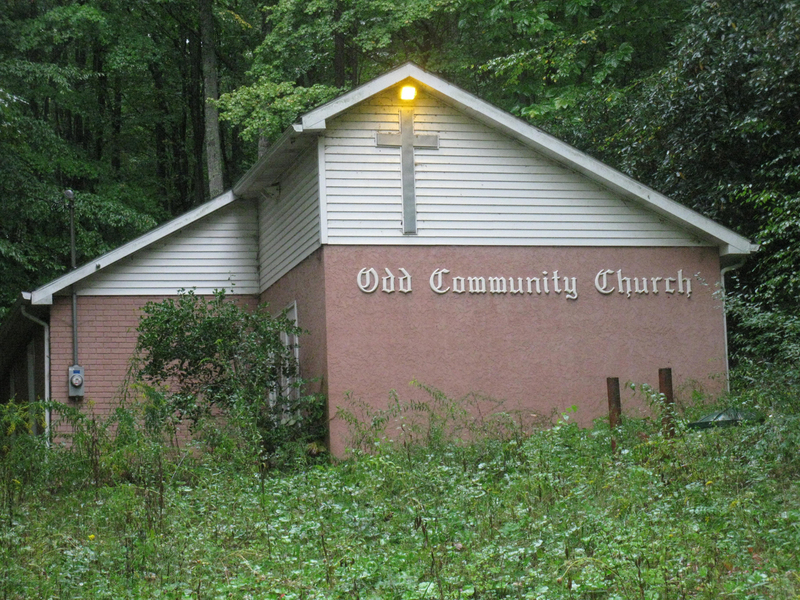 We're poaching on our road-blogging pal Fuzzy Galore's turf with this entry about a cheery character on Long Island. 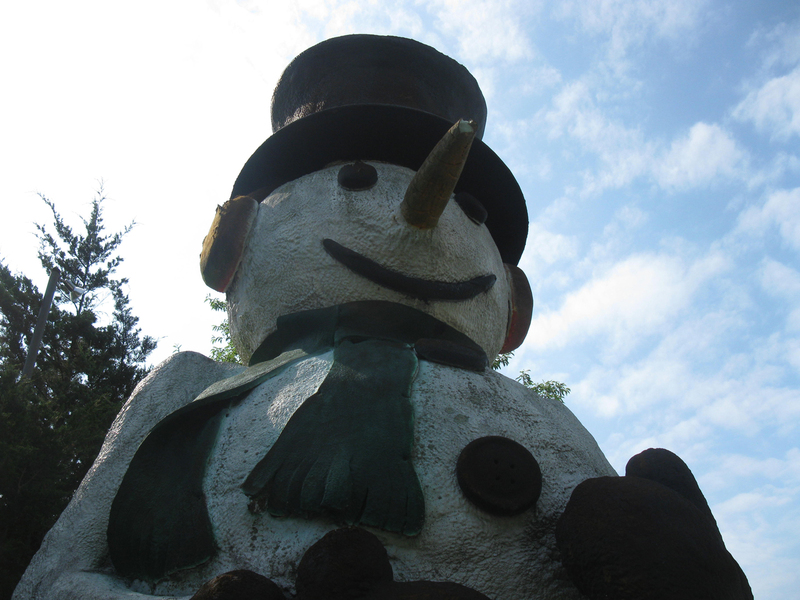 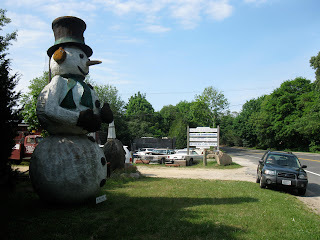 Mr. Millenium, a 20-foot global warming-proof snowman, was erected by the spelling-challenged Flying Monkey Productions, next to North Sea Auto Radiator on Sandy Hollow Road, in, one assumes, the year 2000 (the last two digits are missing from his plaque). 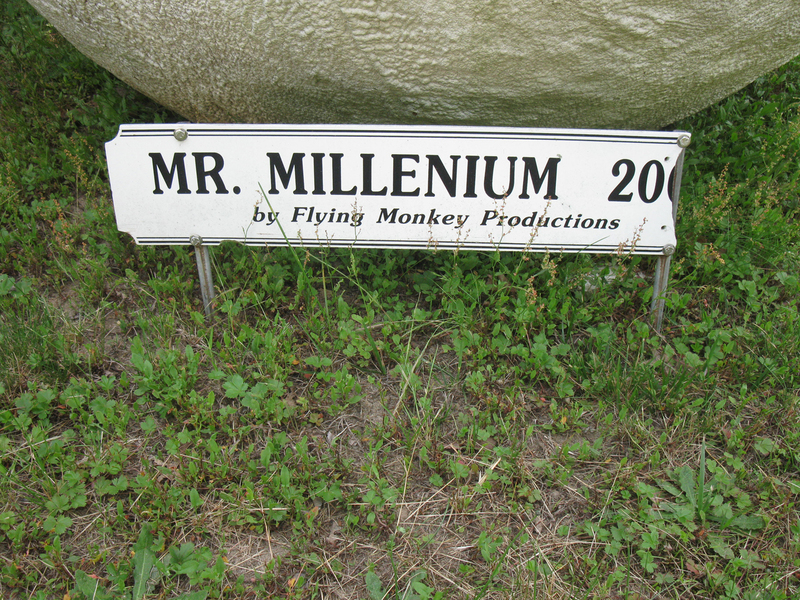 An internet search yields very little information about him or Flying Monkey Productions, but he gives off a great vibe while tooling down the eccentric highway, especially in the non-winter months like May when were we there. We give extra points for the fact that he has that inevitable-dirty-snow-from-road-salt-after-the-pretty-white-snow-has-faded look about him. 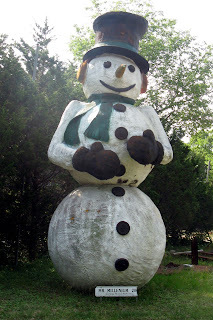 Which makes him snow big deal in our book. 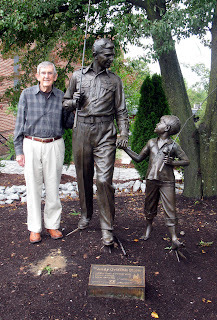 Mr. Emmett Forrest stands next to the statue of his lifelong friend and fellow Mount Airy native Andy Griffith in front of the Andy Griffith Museum. 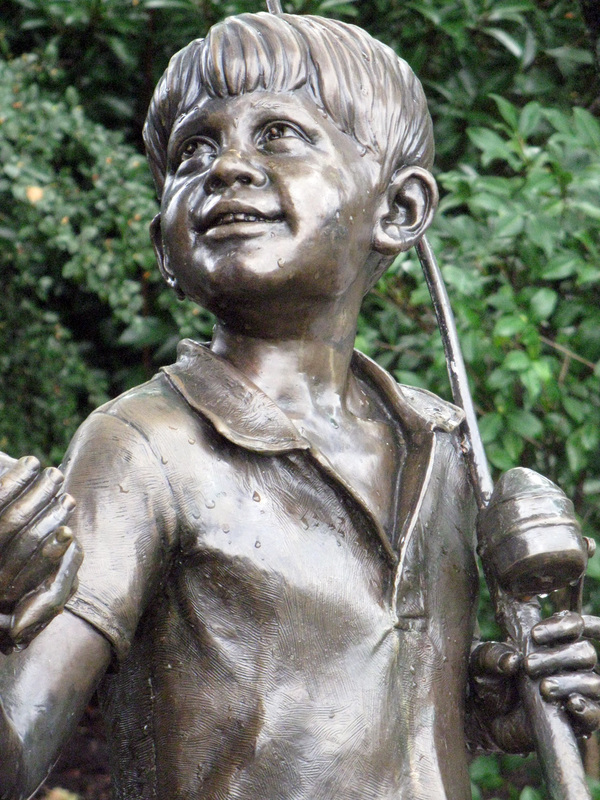 This wonderful statue of Andy and Opie walking to the fishing hole was commissioned by the TV Land network. 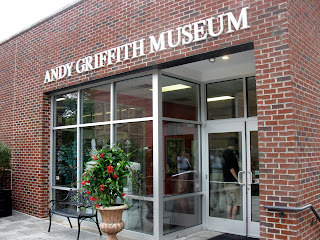 Mr. Forrest has assembled his impressive collection of Andy memorabilia into the Andy Griffith Museum. 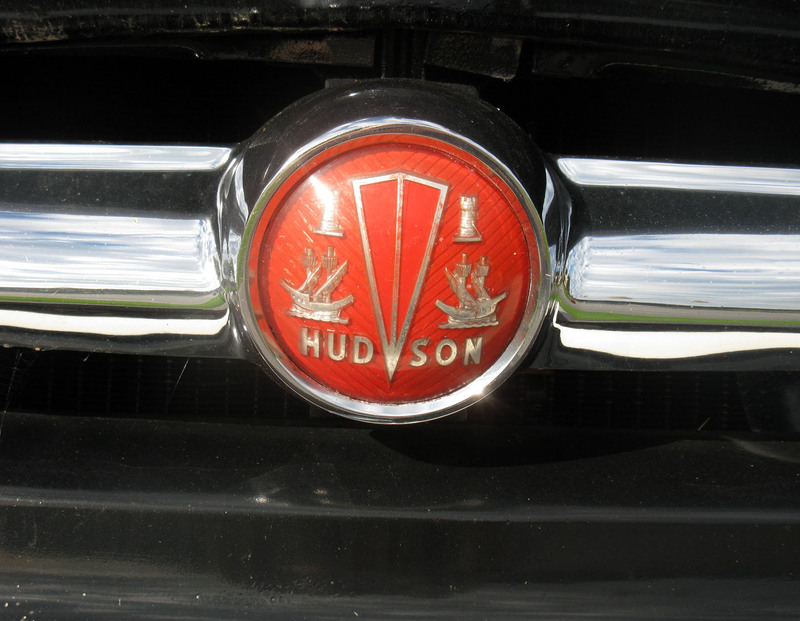 In it you'll find Andy's sheriff uniform (from Nudie's Rodeo Tailors of Hollywood) and the seersucker jacket he wore on "Matlock", Barney's salt-and-pepper suit, worn on dates with Thelma Lou and cut just right for dancing the dip, Goober's Jughead-style cap, and Otis's rumpled jacket and hat, not to mention tons of scripts, posters and other mementos from Andy's impressive and long career. 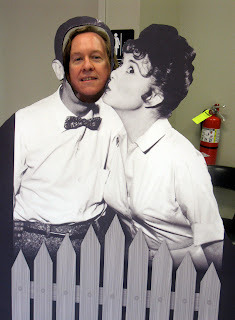 No pictures were allowed inside the museum but I did take advantage of this photo op in the lobby. That's Betty Lynn as Thelma Lou. 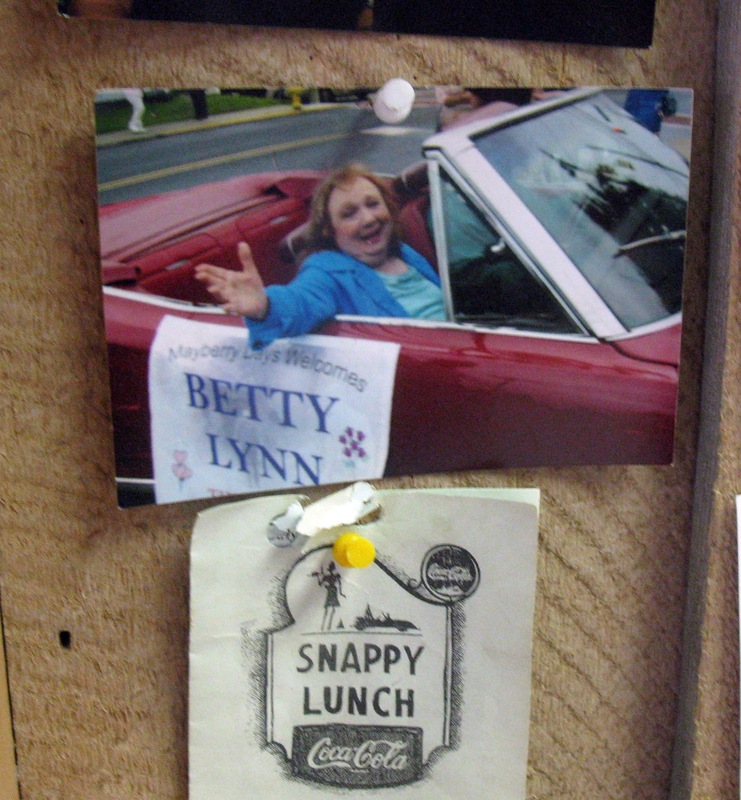 Betty Lynn moved to Mt. 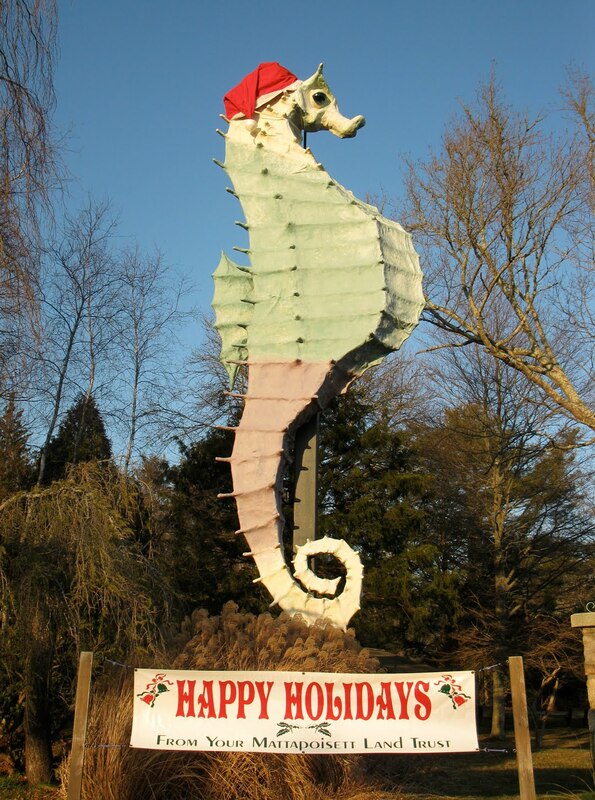 Airy several years ago and makes frequent appearances around town. 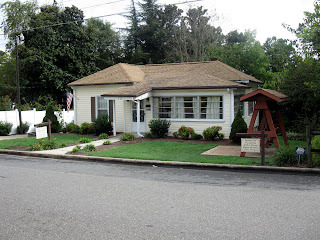 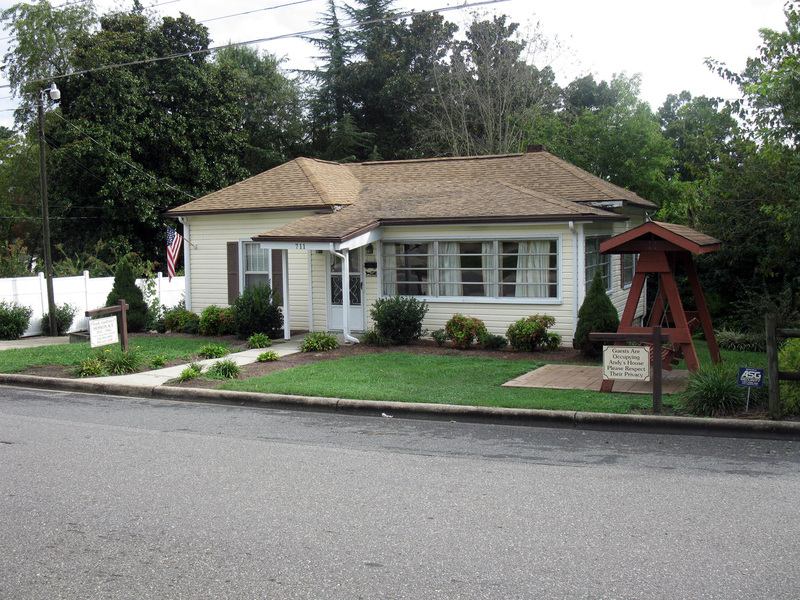 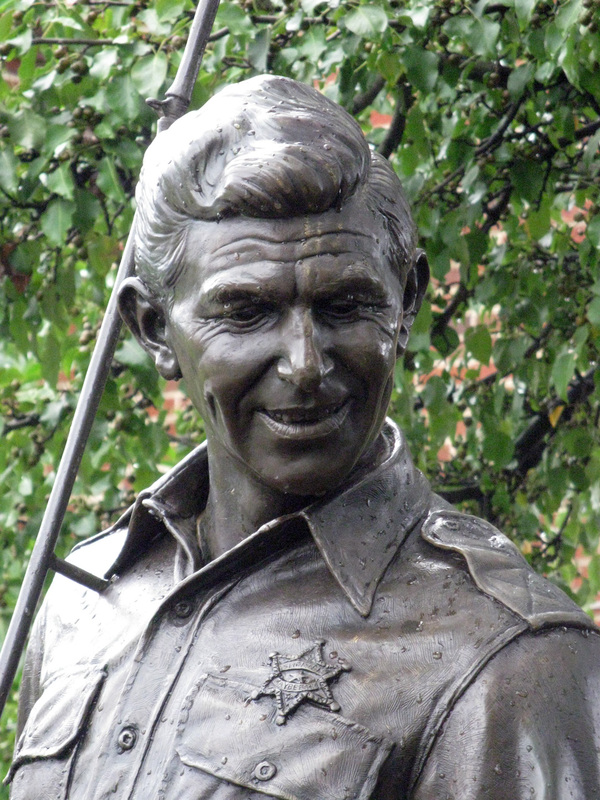 Visitors interested in the full Andy Griffith experience can stay a night or two in the real Andy's childhood house, a modest middle class bungalow on East Haymore Street and now rented out by the Hampton Inn folks. 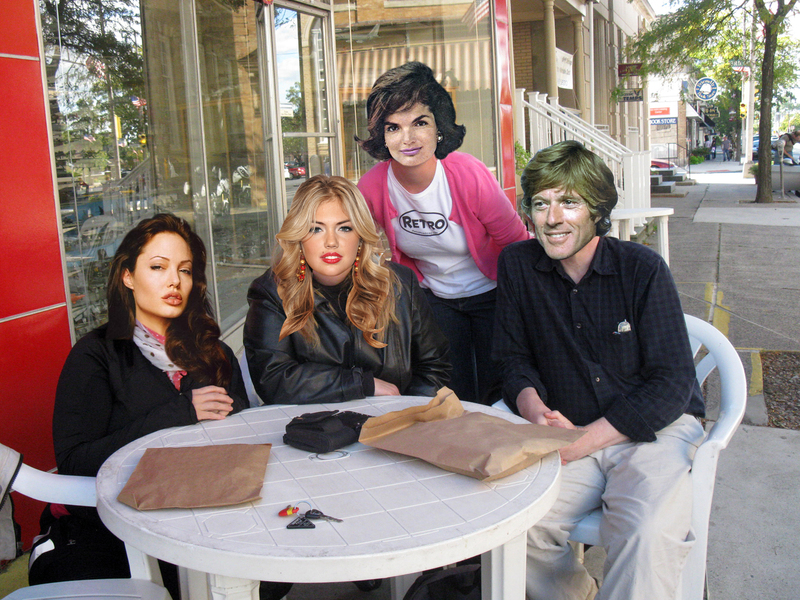 The Snappy Lunch, in business since 1923, was mentioned by Andy in the "Andy, The Matchmaker" episode. 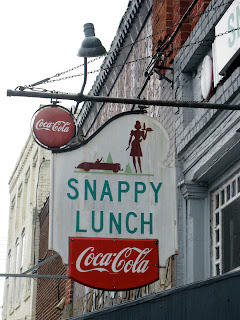 They're known for their pork chop sandwiches. 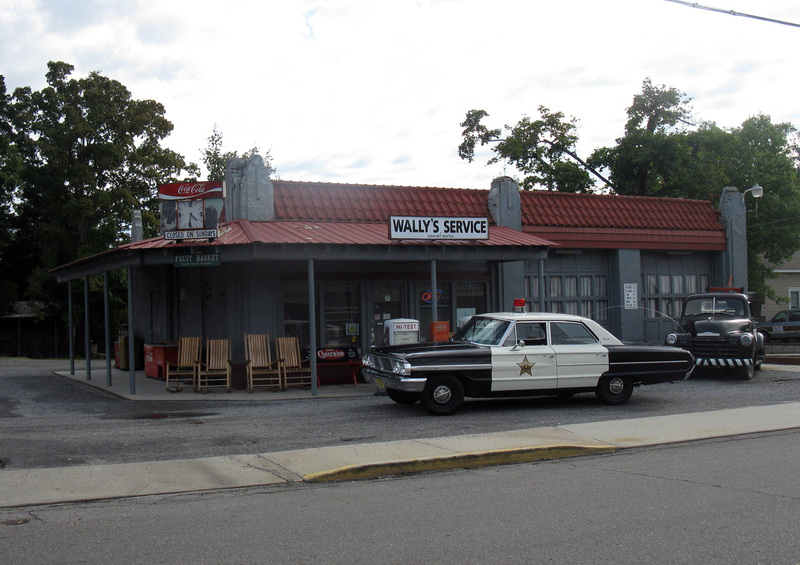 Mount Airy also has a recreation of Wally's Filling Station, where Gomer and Goober plied their trade. 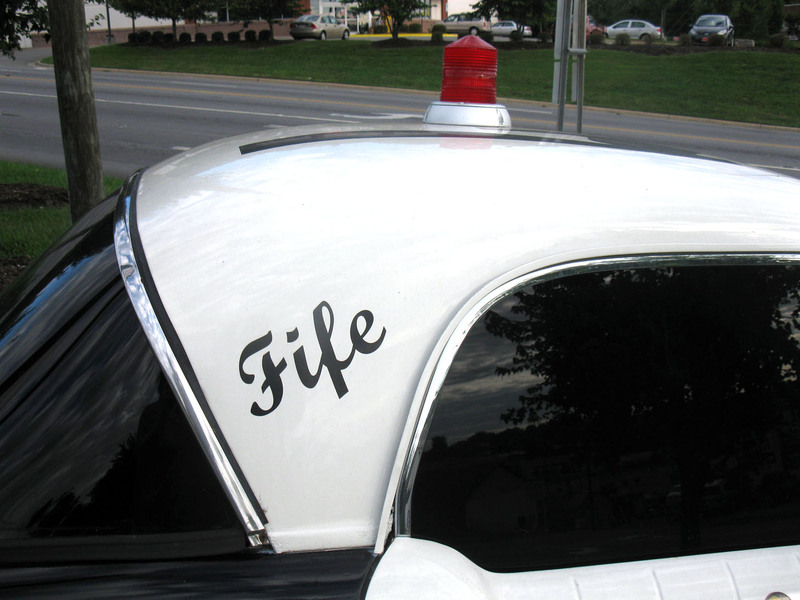 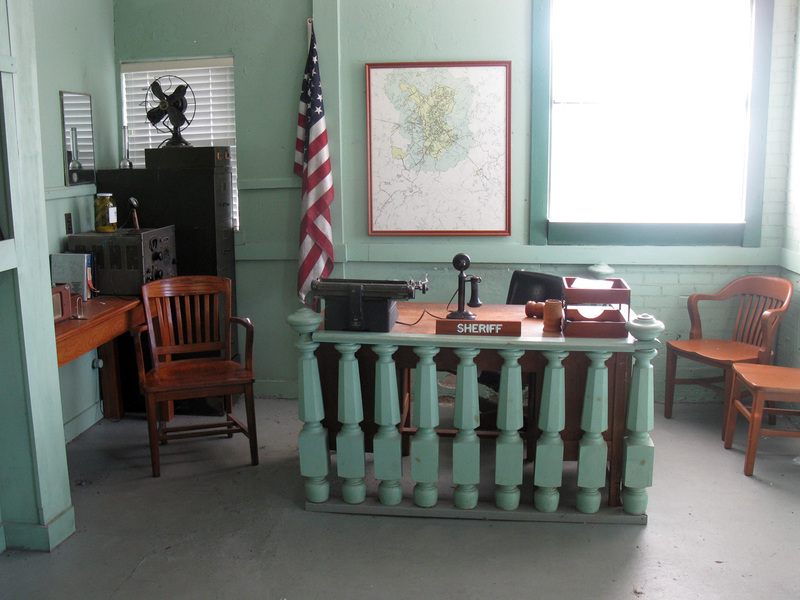 You can take a tour of Mount Airy in an early 60s Ford Galaxy squad car just like the one Andy and Barney used to patrol the mean streets of Mayberry. 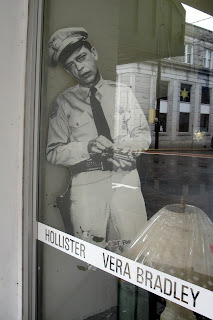 Old dead-eye Barney keeps watch over the Vera Bradley merchandise. In 2002, Gov. 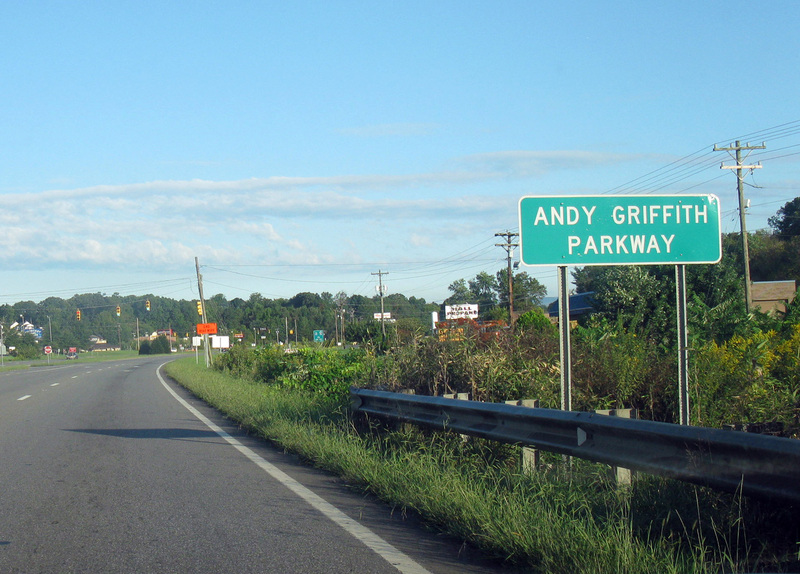 Mike Easley dedicated 10 miles of US 52 from Interstate 74 to the Virginia state line The Andy Griffith Parkway. 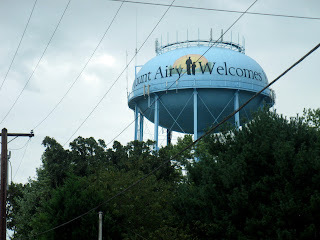 The Andy Griffith Show is such a part of the character of Mount Airy, they put Andy and Opie on the water tower. 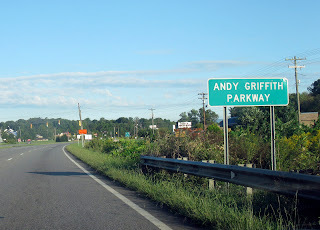 The northwestern North Carolina town of Mount Airy was where Andy Griffith grew up and he used it as the inspiration for Mayberry, the fictional locale of his classic 1960s TV series, "The Andy Griffith Show". Even though "T.A.G.S." 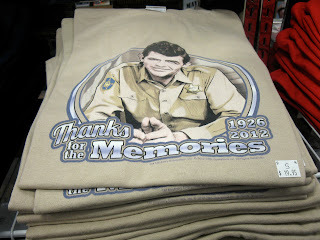 went off the air in the late 60s, Mount Airy still celebrates their favorite son all over the older downtown area. 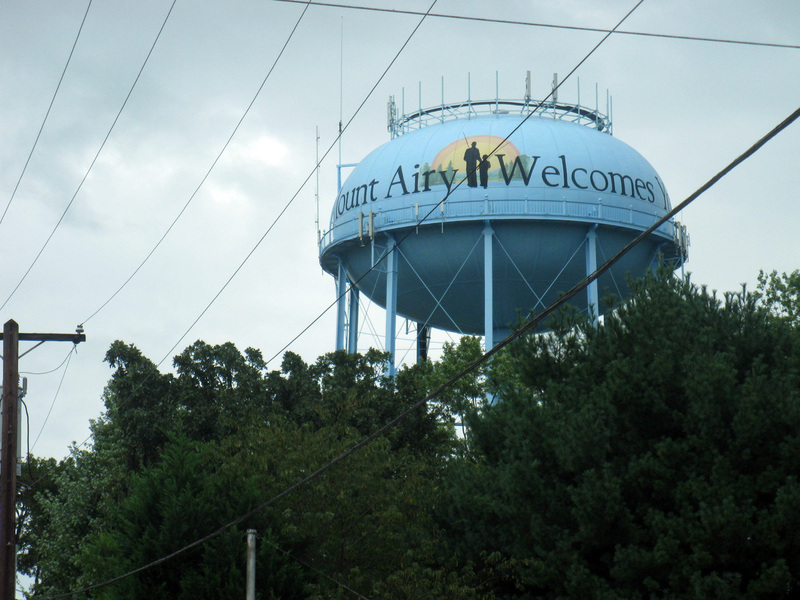 Mount Airy is actually a pretty big place now, with a Walmart, motels, fast food and a population of over 10,000. 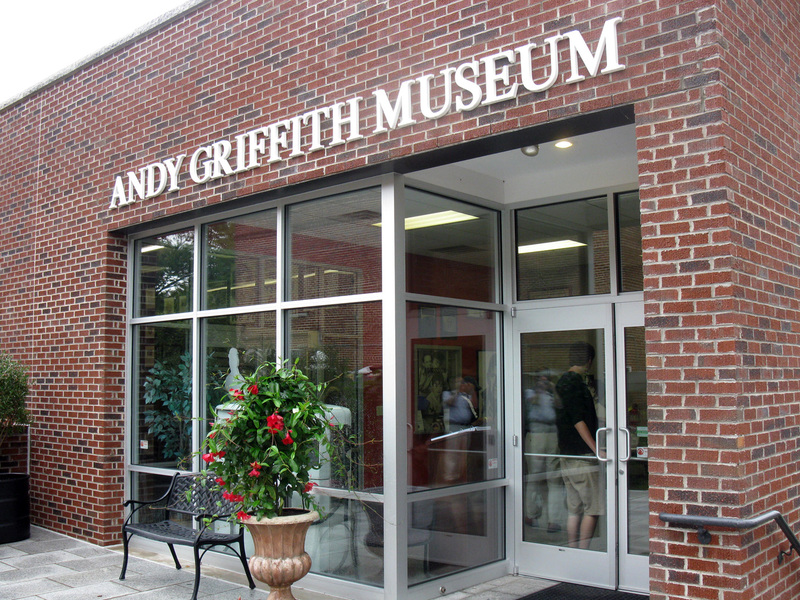 But if you head to the old downtown area, you can still get a taste of the small town that Andy loved. 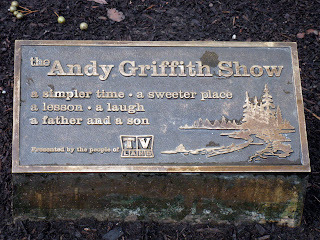 And don't that beat everything. 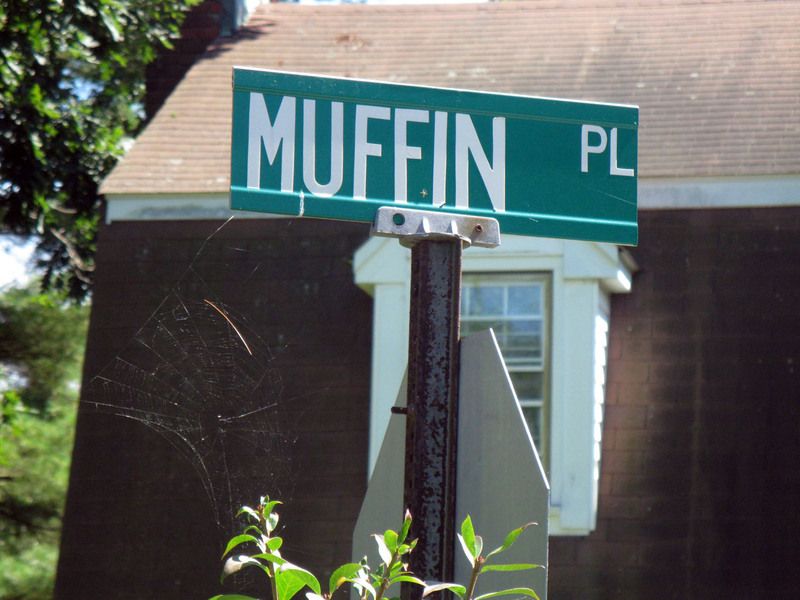 If you haven't been here, you ain't seen Muffin yet. 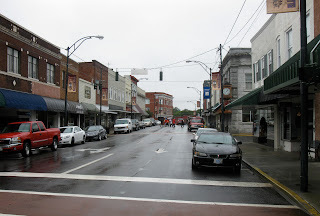 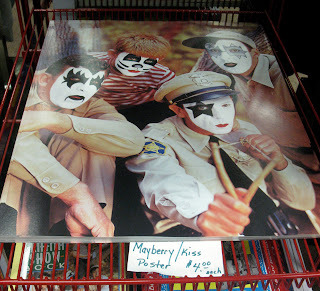 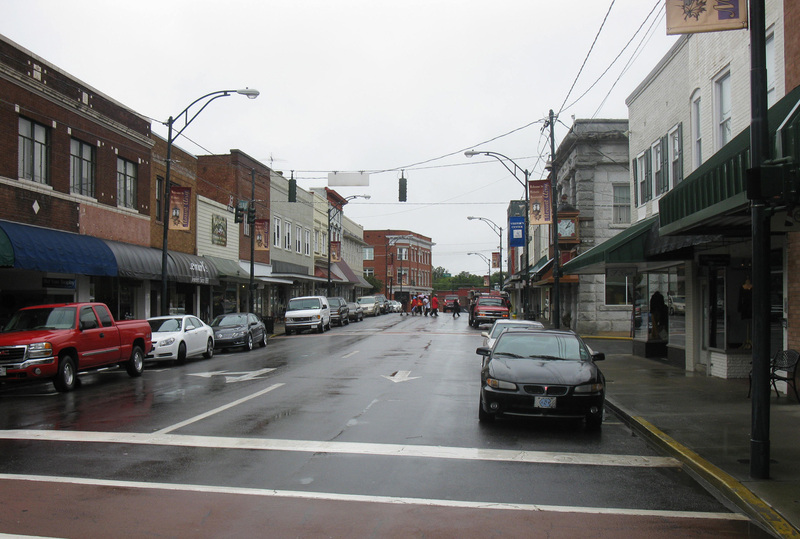 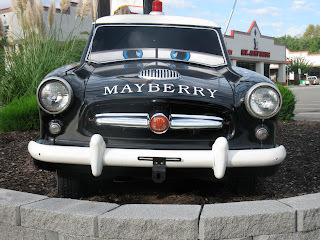 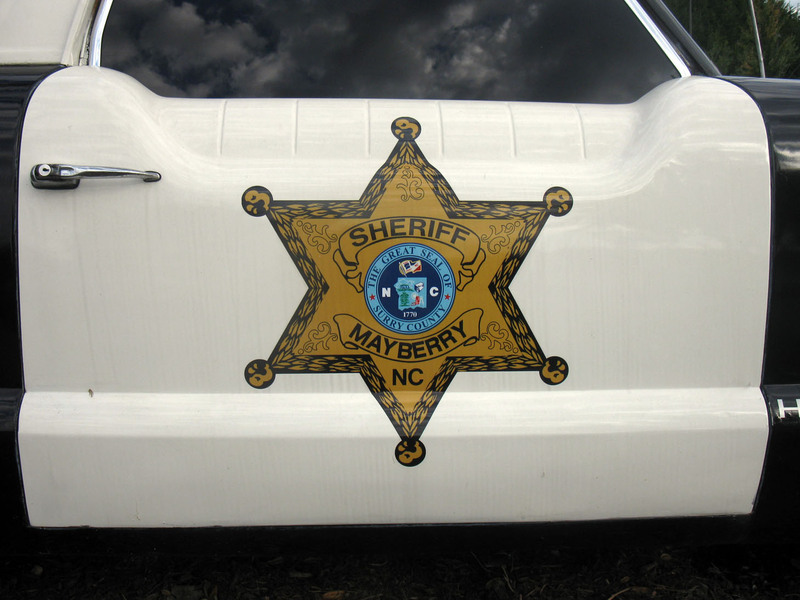 Mount Airy, North Carolina is very proud of being the inspiration for Mayberry, the fictional small southern town on "The Andy Griffith Show". 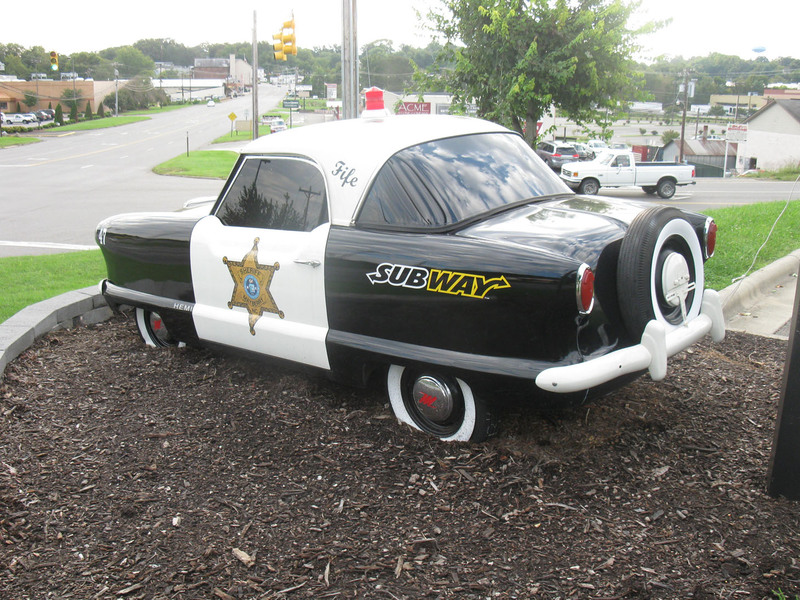 There's a Subway restaurant there with a unique Mayberry-flavored attention-getter out front: a Nash Metropolitan done up like a Mayberry squad car. 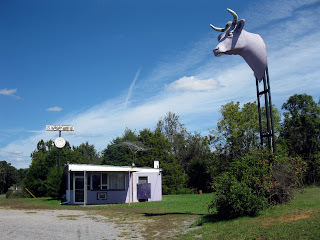 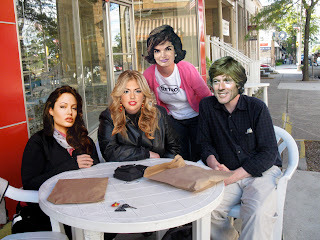 Any Nash Metro is tops in our book (check this one out), but the Mount Airy one is a real curiosity, as Andy and Barney always patrolled around town in Ford Galaxies, not Metros, and they usually ate at the Bluebird Diner or Snappy Lunch, not Subway. 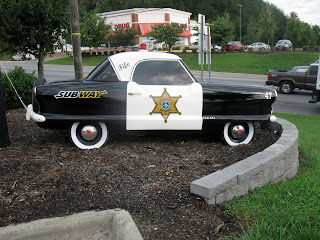 We love it, though, for its retro incongruity and salute Subway for repurposing a true classic. 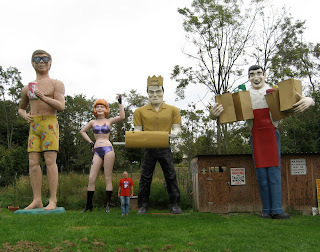 As Andy would say, "You beat everything, you know that?" 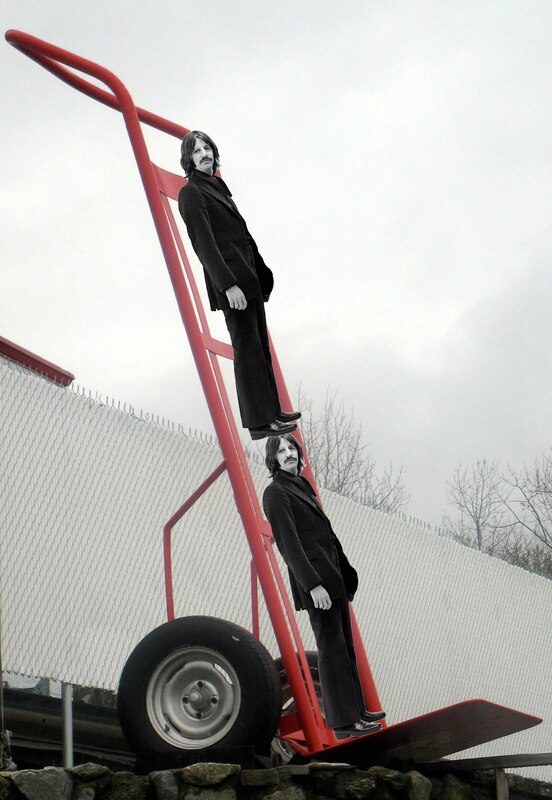 ...or Pink Floyd if you prefer. 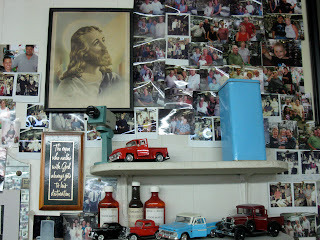 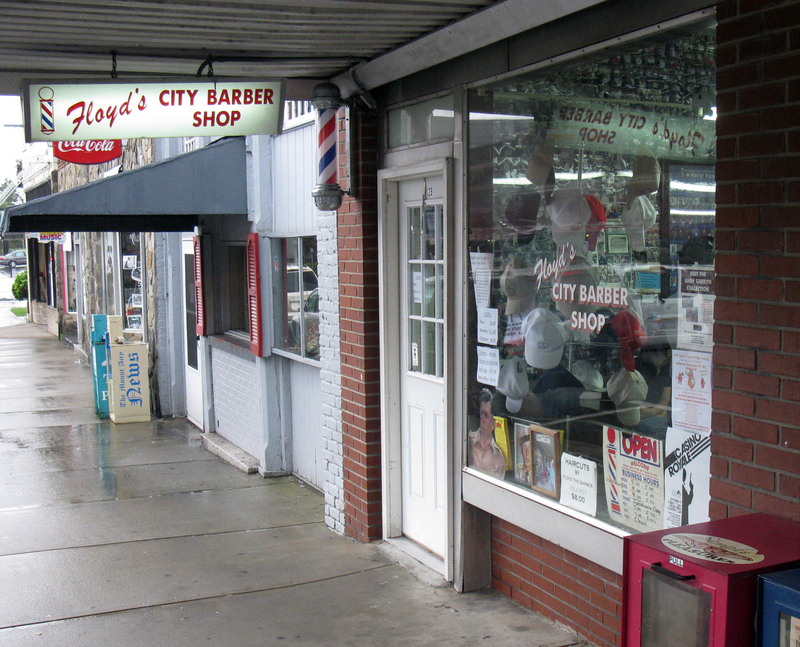 Floyd's City Barber Shop is on Main Street in Mount Airy, North Carolina, the real Mayberry. 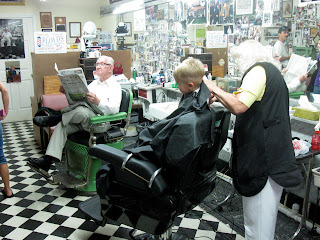 Russell is a barber showing photographs of every head he's had the pleasure to know. That long-haired fellow looks like he could use a trim. 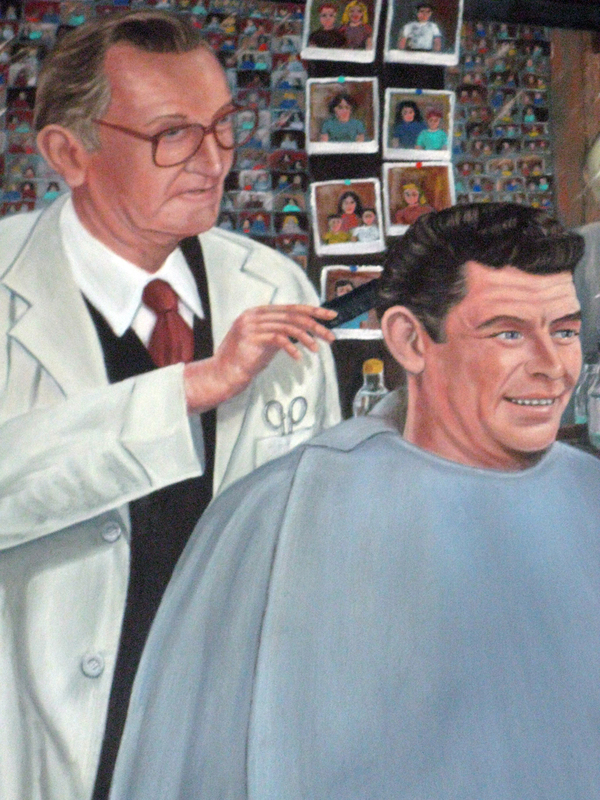 Russell Hiatt has been a barber for over 60 years in Mount Airy, North Carolina and he used to cut the hair of Mount Airy's most famous resident, Andy Griffith. 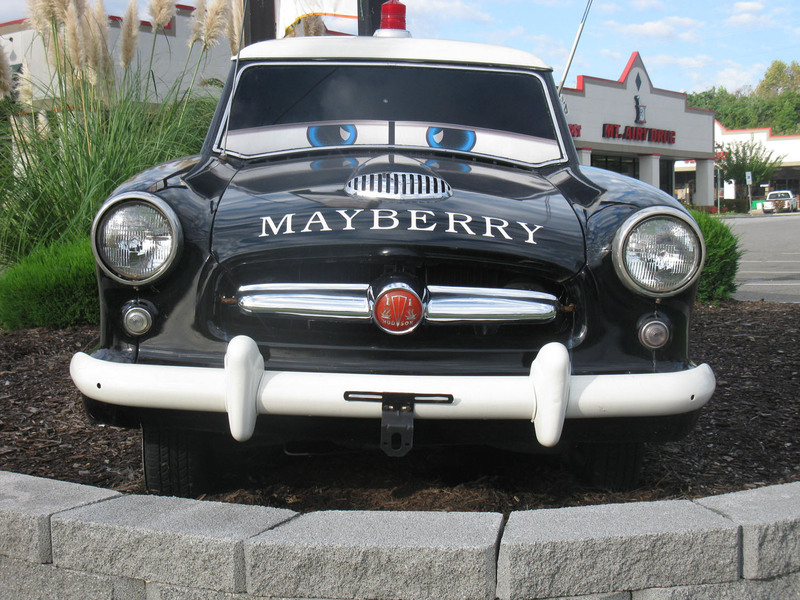 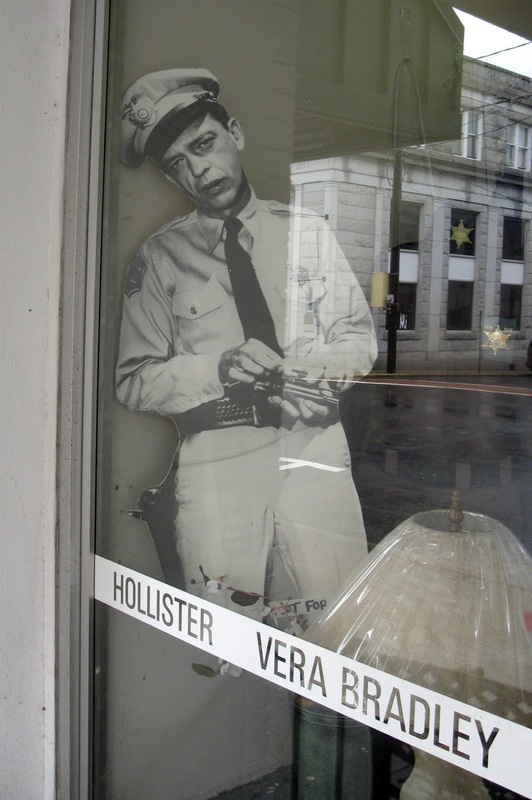 Mount Airy's small town charm became the inspiration for Mayberry on "The Andy Griffith Show" in the 1960s and the easy-going, often-befuddled town barber on the show was named Floyd, with the great eccentric actor Howard McNear playing the part. 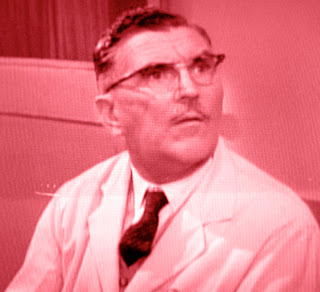 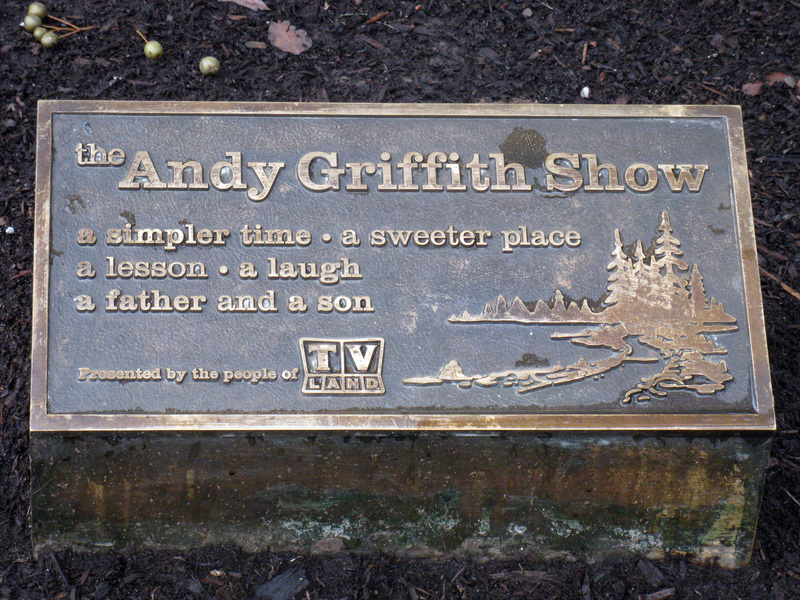 "The Andy Griffith Show" became one of the all-time classic TV sitcoms and McNear's portrayal of Floyd is a real one-of-a-kind, with his rapid-fire delivery in the early seasons, and then his slow, somewhat bizarre line-readings in later episodes (McNear had a stroke during the run of the show that altered his performance but not his ability to be really funny). 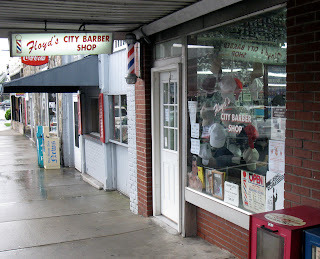 Mount Airy takes great pride in being put on the map by Andy and Floyd's City Barber Shop is still in business on Main Street, with Mr. Hiatt and his staff giving haircuts (still for $8 reads the sign in the window). 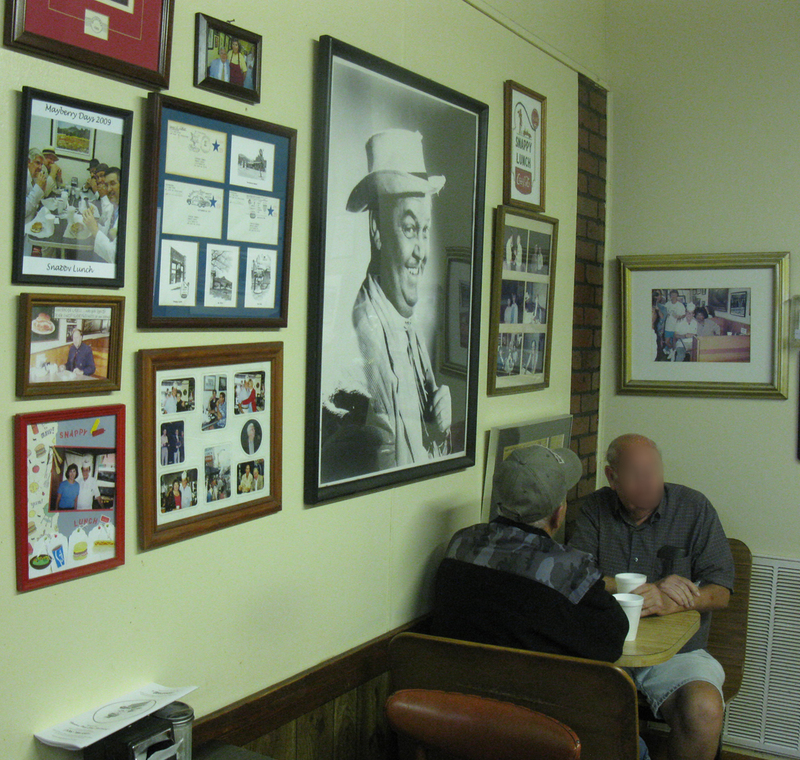 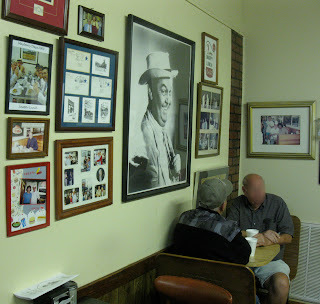 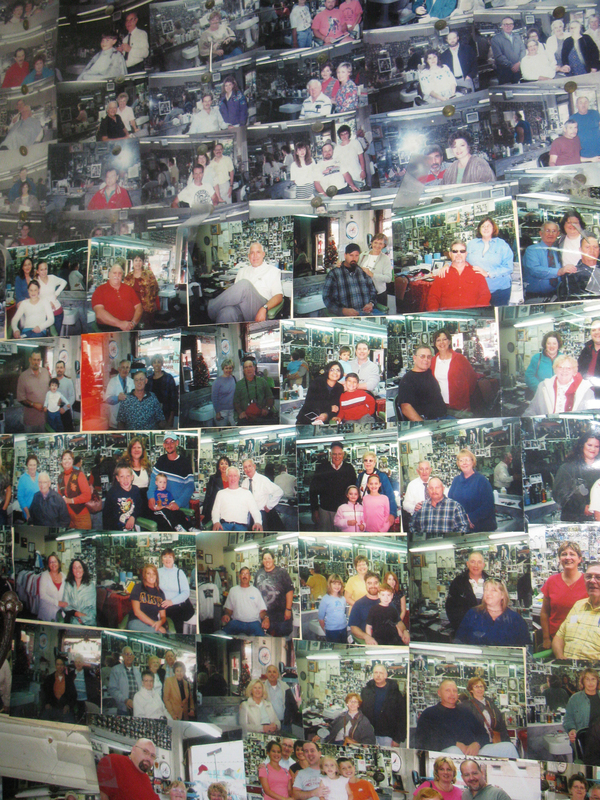 Unlike the one-chair Floyd's on the show, it's a two-chair shop, packed with mementos and plastered with photographs of Floyd's satisfied customers and visitors on the walls. I had just had my hair cut back home so I didn't get the once-over, but I did step inside for a moment to gawk like a tourist, which they're used to there. 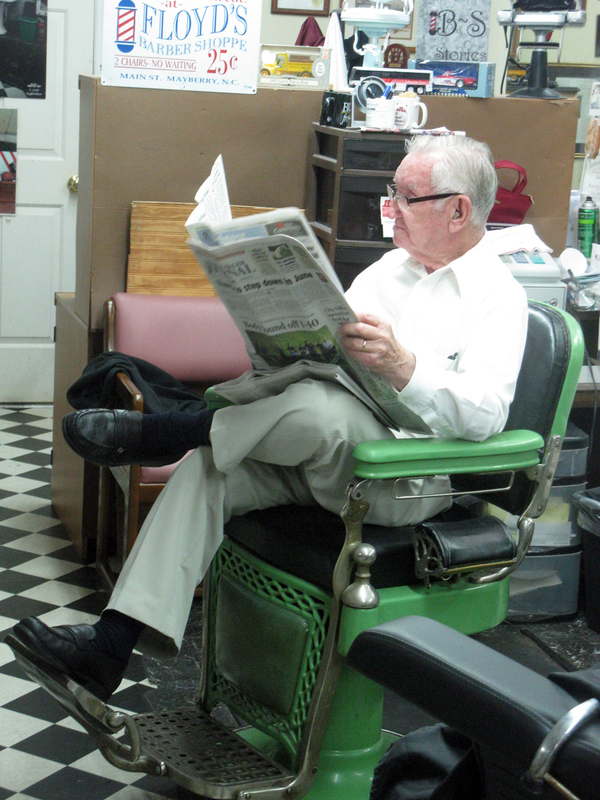 And Mr. Hiatt was sitting in one of the barber chairs, engrossed in his newspaper, just like the TV Floyd. 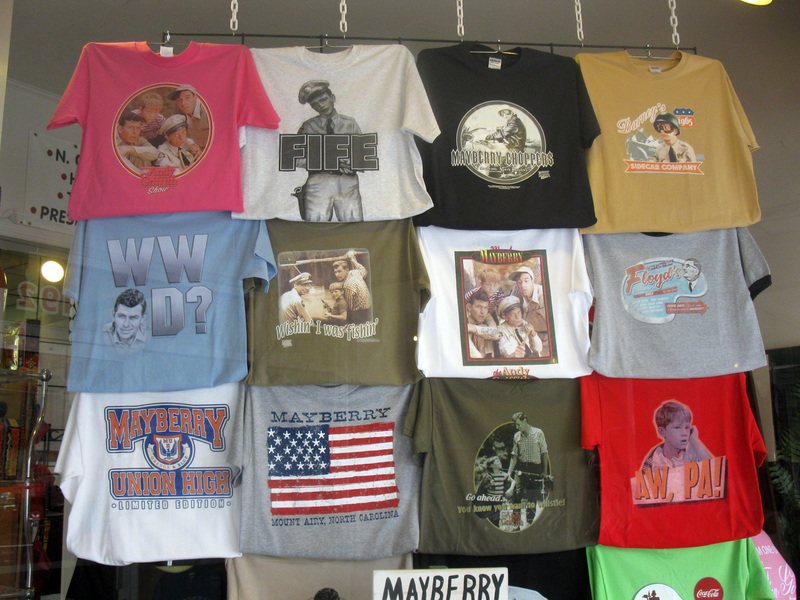 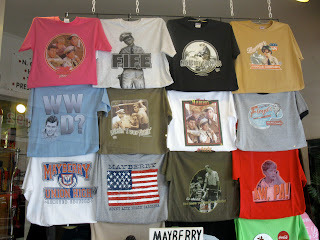 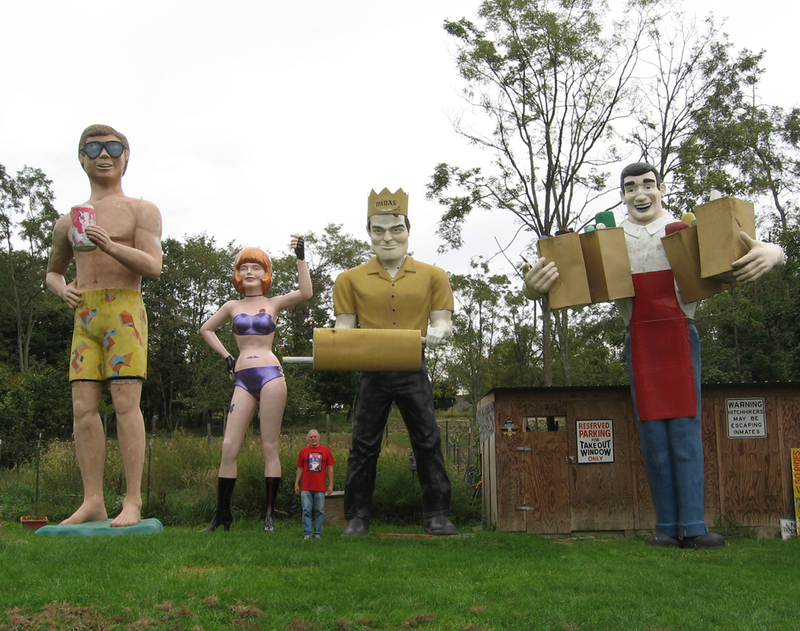 It's great to see a small town business still thriving, even if it is due to pop culture. 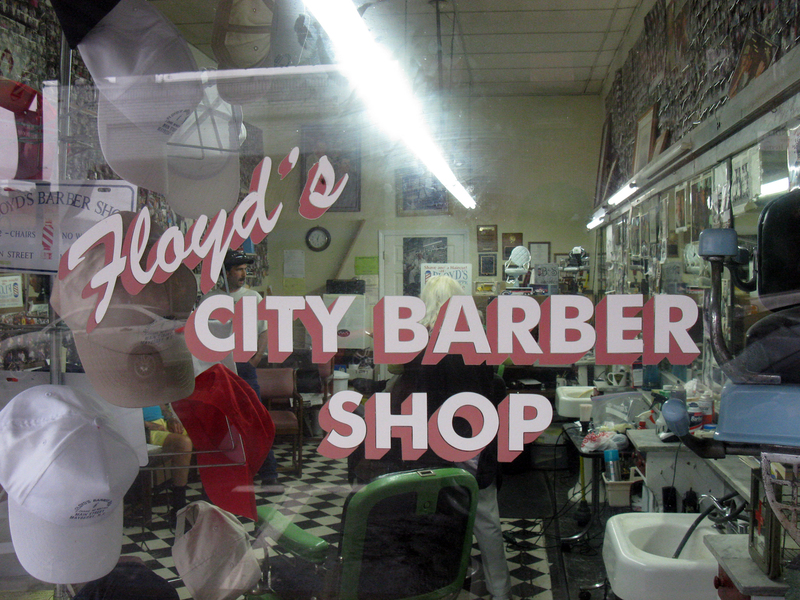 After all, as the TV Floyd would say, "you hate to see anyone fall into the hands of a strange barber."